The Reef Bay Trail in the U.S. Virgin Islands National Park holds the secrets of St.John’s tropical forests, sugar mill ruins, and ancient petroglyphs. The two-mile trail explores the depths of the island, featuring a steep rocky terrain, 40 foot waterfall, and a freshwater pond near the trail’s end. When adventuring from your CimmaronStJohn vacation home, pack a light lunch, plenty of water, and a swimsuit to take a dip. Other trails along the island explore a taste of nature and history. These include the Ram’s Head Trail and Cinnamon Bay Trail, but the Reef Bay Trail is a sure favorite of St. John hiking trails. You will find off road parking at the Reef Bay trailhead along Centerline Road about halfway between Cruz Bay and Coral Bay. The rocky trail descends steeply from 900 feet above sea level to the rocky beach at Reef Bay. Bring plenty of water, bug spray, and wear sturdy walking shoes. 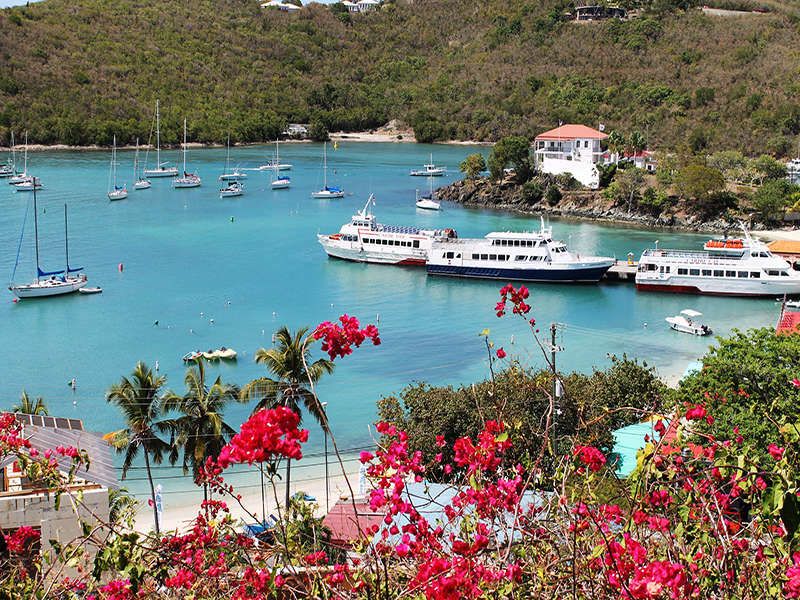 To avoid the steep 2-mile uphill return, you can make advance reservations for a guided tour of the trail through the U.S. Virgin Islands National Park. The tour includes transportation to the trailhead and then a boat ride at the end of the trail back to the National Park Visitor Center in Cruz Bay. A hike through the tropical forests of St. John wouldn’t be complete without some beautiful water features. Along the Reef Bay Trail, you will find a stunning 40-foot waterfall, with a freshwater pool at the base. This fresh water at the bottom provides a home for a variety of wildlife. Shrimp, frogs, fish, hummingbirds, and dragonflies live near this reflective pool. You can take a rest here near the end of your hike and take in all the beautiful shades of green among the ripples. There are some historic elements along the Reef Bay Trail that will catch your attention. The sugar mill ruins along the Reef Bay Trail remind you of a different era on the island and carry a dark shadow of history. Another historic element is visible on the rocks surrounding the freshwater pool near the trail’s end. Here, you will see some mysterious carvings. Archaeologists believe that these carvings are in fact sacred symbols carved by Taino Indians over 1,000 years ago. These petroglyphs are a great historic treat at the end of a great hike. After hiking the Reef Bay Trail, come back to your CimmaronStJohn vacation villa. Relax on your expansive deck and in your private pool of Jacuzzi. Enjoy incredible panoramic views of the island, surrounding bays and beaches, and the Atlantic Ocean or Caribbean Sea. Then, make a delicious dinner in your own kitchen or go out to eat at one of the wonderful restaurants on St. John. Finally, once you’re done with all your day’s adventures, return to the lounge chairs on your deck and gaze at the amazing star field.